1C is the name of the accounting products of “1C” company. Number of solutions implemented under “1C” is about half a million. This system does not have a localized English version, but it is widespread in CIS countries. 1. 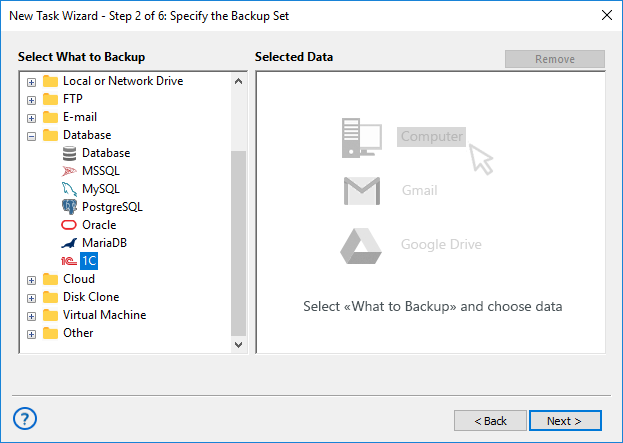 Select Backup task in New Task Wizard. 2. Select 1C option option on step 2 of New Task Wizard. Existing 1C configuration. You can select ready 1C data configutation. New configuration. Click onto the create a connection… string, or select it and click OK.
4. Set up other parameters and click OK. Your backup is ready. Select Restore task, and then click Next. 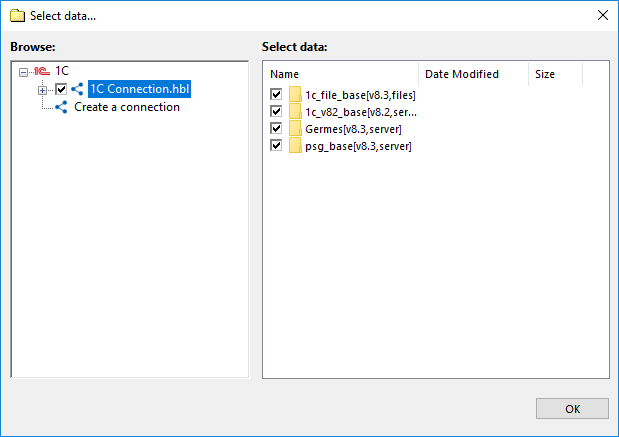 Find the index file (backup.hbi) located in the destination folder. Select it, and then click Next. You 1C files will be restored form backup.